Siliguri: Neither Gorkhaland nor Sixth Schedule status. The current lot of politicians in Darjeeling Hills have now raised the demand for inclusion of the region in the Fifth Schedule of the Constitution. Binay Tamang, the president of a faction of the Gorkha Janmukti Morcha (GJM) that enjoys the backing of the state government, today said that the party has decided to press for inclusion of entire north Bengal in the Fifth Schedule. “In our party’s foundation day, it has been resolved that GTA areas and the rest of north Bengal should be declared a Scheduled Area. This will help this economically backward region develop and, in turn, benefit all the communities living here,” Tamang, who also happens to the chairman of Gorkhaland Territorial Administration (GTA), today told reporters at Bagdogra Airport in Siliguri. 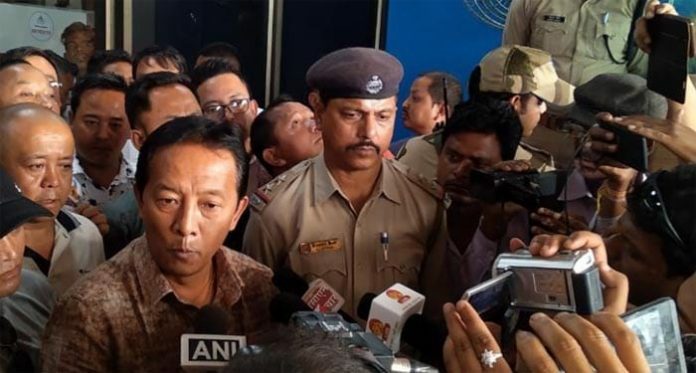 Tamang was in Delhi yesterday to participate in a demonstration against the BJP-led Centre’s alleged double standards as regards the Gorkhaland demand. The demonstration, however, was cancelled as Delhi Police withdrew the permission at the last moment. “They allege that there is no democracy in Darjeeling. But it is in Delhi where democracy is being trampled. At the phone call of BJP minister SS Ahluwalia, Delhi Police did not allow us to hold the demonstration,” he said, adding that the party later held the foundation day meeting at Vasant Vihar in the Capital. “If Gujarat and nine other states can have Scheduled Area, why not north Bengal? After Deepavali, we will hold a series of protest rallies and meetings in Delhi to press for this,” Tamang added. Under the provisions of the Fifth Schedule of the Constitution, Scheduled Area is treated differently from the other areas because they are inhabited by socially and economically backward aboriginals and special efforts need to be made to improve their condition. The entire set of normal administrative machinery is a state is not extended to a Scheduled Area, and the Central government shoulders a greater responsibility for its overall development. There are Scheduled Areas in Bihar, Jharkhand, Chhatisgarh, Odisha, Himachal Pradesh, Rajasthan, Gujarat, Madhya Pradesh, Tamil Nadu, Telangana, and Andhra Pradesh. Neither Gorkhaland nor Sixth Schedule status. The current lot of politicians in Darjeeling Hills have now raised the demand for inclusion of the region in the Fifth Schedule of the Constitution.